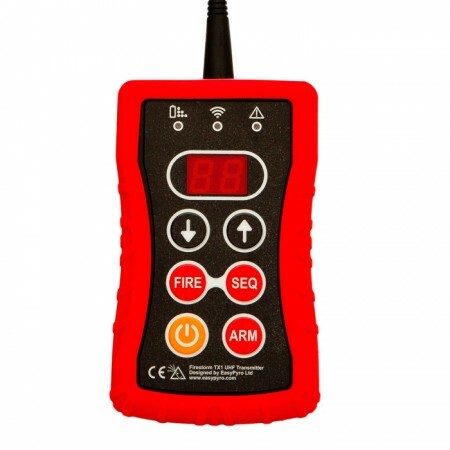 Rugged handheld transmitter for the FireStorm wireless firing system. The TX1 transmitter allows any of the FireStorm firing modules to be controlled with millisecond accuracy. The transmitter also allows fast sequences to be fired across multiple firing modules allowing interesting effects such as body hits, machine gun fire and bullet strafes to be created. Large tactile buttons. Easy to use with gloved hands. Bright display and indicators can be read in sunlight. 9 Channels / 99 Cues per channel (891 Cues in total). Long range (800M line of sight / 400M ground level range). Consider the TX2 Control Desk Transmitter and compare the Control Desk and Handheld Transmitter (PDF).